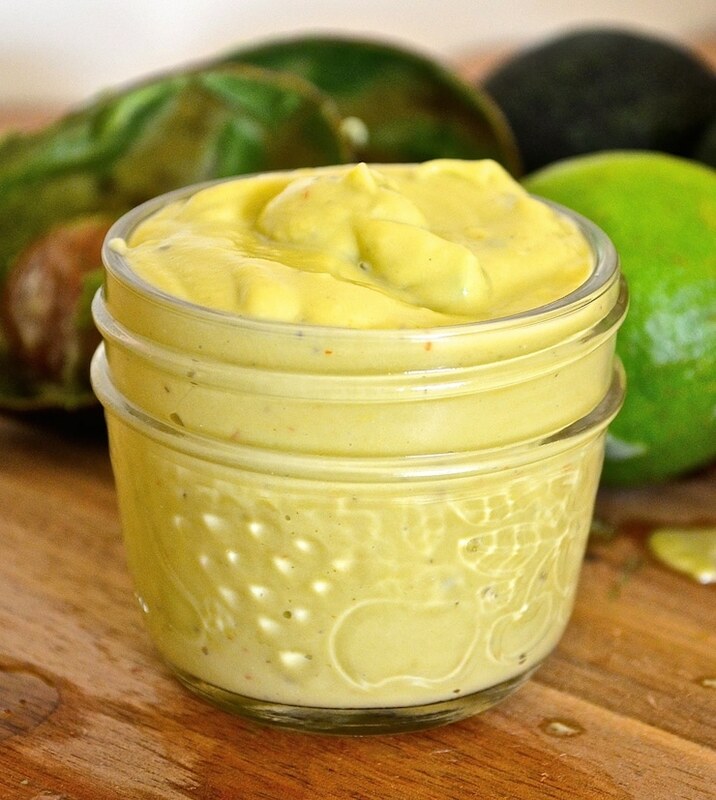 This Creamy Avocado Lime Dressing is incredibly delicious and very versatile. It can be made as thick or thin as you like to suit whatever you are serving it with. Add some extra liquid to it and it becomes an amazing salad dressing or vinaigrette which coats and clings to the leaves perfectly, or reduce the liquid and it ends up thick like mayonnaise. I have been trying to perfect a falafel recipe over the past few weeks. So far I have great flavour but they have been a little dry. I am now experimenting with various additions which will hopefully remedy the dryness and bring you a falafel that you will love, but with my experimenting come lots of falafel, and I mean LOTS! Of course I have been eating my poor falafel rejects, but because they have been pretty dry I decided to come up with a dressing to serve with them. This Creamy Avocado Lime dressing is the perfect accompaniment and is a great antidote to the dryness. Of course it will also go well with falafels that aren’t dry (as well as a whole host of other things) …you just might not need to smother them with as much as I did! 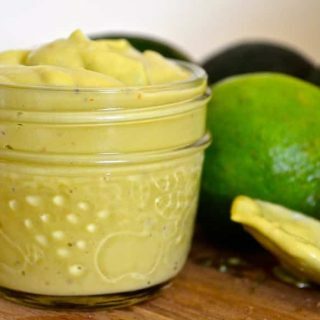 This Creamy Avocado Lime Dressing is incredibly delicious and very versatile. It can be made as thick or thin as you like to suit whatever you are serving it with. Add some extra liquid to it and it becomes an amazing salad dressing or vinaigrette which coats and clings to the leaves perfectly, or reduce the liquid and it ends up thick like mayonnaise. It can then be spread in sandwiches as a mayonnaise substitute, dolloped on veggie burgers, baked potatoes, burritos, tacos, used as a dip for chips, chopped vegetables and it also goes perfectly with falafel……As I know only too well. This dressing keeps well in the fridge for a few days. Don’t be worried if the colour changes a little. It won’t affect the flavour. 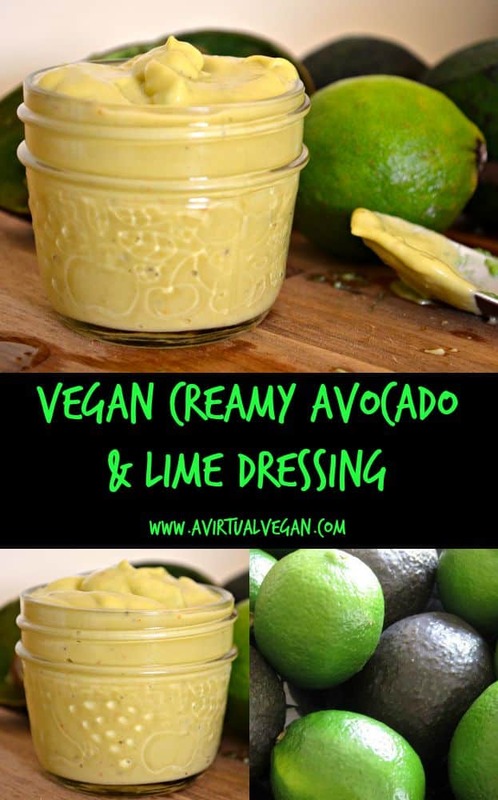 Leave me some feedback below so I know what you think of this Creamy Avocado Lime Dressing guys! You can also share your pictures on Instagram but be sure to tag me on @avirtualvegan and add the hashtag #avirtualvegan so I don’t miss them! If you love avocado then try my Avocado Toast for a quick and easy breakfast or lunch. This Creamy Avocado & Lime Dressing is incredibly delicious and very versatile. It can be made as thick or thin as you like to suit whatever you are serving it with. Add some extra liquid to it and it becomes an amazing salad dressing or vinaigrette which coats and clings to the leaves perfectly, or reduce the liquid and it ends up thick like mayonnaise. Add all ingredients except the vinegar in a blender or food processor. Add more water if you want a thinner dressing as per recipe notes. If you will be using this Creamy Avocado & Lime Dressing as a salad dressing then I suggest adding the full amount of vinegar stated in the recipe. If you will be using it as a mayonnaise substitute or dip then you probably won't want quite as much vinegar. I suggest blending all of the ingredients except the vinegar then adding it gradually, tasting as you go so that you get the right amount for you. If you need your dressing to be thinner to use as a vinaigrette or salad dressing then just add extra water gradually until you get the consistency you want. This recipe is part of the Life With Lorelai link party .